We have been writing the predictions for healthcare every year now for the past 10 years. We also review back how we did each year and each year we are getting to be more accurate. The 2018 predictions that were released in December 2017 were almost 98% accurate and each one of them panned out during the course of the year. Globally, 2019 will be a year of value-based care as we expect the ‘outcomes-based care’ focus to globalize. This will trigger maturation of risk-sharing in solution contracting between providers and drug/device original equipment manufacturers (OEMs), driving business value for providers. Furthermore, access to affordable and quality care will be key political agendas for upcoming 2019 elections in emerging markets such as Asia, Africa and, Central and Eastern European countries. As the lines between retail, IT and healthcare industries continue to blur, during 2019, Google, Apple, Facebook and Amazon (GAFA) in the West, and Baidu, Ali Health, Tencent (BAT) in East will start to dominate the Individual Care space. Non-traditional digital marketplace providers such as Ali Health, Tencent, Amazon, Google, Apple, Microsoft, and IBM among other will dominate the home health space, providing the required impetus to public health systems to ensure accessibility and affordability of care. We also anticipate future drugs and devices R&D investments will be more targeted to meet the unique needs of emerging markets in Asia. Finally, we anticipate 2019 will be a reality check for two of the most hyped technologies for healthcare of this decade, viz. artificial intelligence (AI) and blockchain. During 2019, the healthcare industry will continue to transit to the value-based model. We anticipate that by end of 2019, up to 15% of global healthcare spending will be tied in some form with Value/outcome based care concepts. The impetus for this shift will be more exigent for countries that currently spend nearly 10% or more of their GDP on healthcare spend [e.g., the United States, Netherlands, Sweden, France, Germany, Canada, and Japan among others]. During 2019, VBC initiative will continue to transition from economic model/cost-effectiveness measures to more health outcomes and treatment focus - by means of data-driven risk sharing frameworks and sustainable reimbursement model that benefits both providers and payers. During 2019, AI across clinical and non-clinical use cases will show hard results further bolstering the growth of in healthcare space. We expect AI for Healthcare IT application market to cross $1.7 billion by end of 2019. We further anticipate that by operationalizing AI platforms across select healthcare workflows would result in 10–15% productivity gain over the next 2-3 year. However, the pricing for AI solutions remains critical as end-users are often not convinced to dedicate an additional budget for such IT capabilities. A cost effective approach with clear evidence for potential ROI for both parties can help sustain the market growth. Throughout 2019, AI and machine learning will further evolve human and machine interaction. More specifically, AI will begin to see fruition, particularly in the imaging diagnostic, drug discovery, and risk analytics applications. During 2019, the application of digital health will continue to go far beyond the traditional system and empower individuals to be able to manage their own health. Based on our estimates, it is expected that digital health tech catering to out of hospital settings will grow by 30% to cross $25 billion market globally by end of 2019. Increasing cost burden from chronic health conditions and aging population will be the chief driver for digital health solution such as RPM devices, telehealth platforms, PERS, and mHealth applications. Furthermore, favorable reimbursement policies towards clinically relevant digital health applications will continue to expand care delivery models beyond physical medicine to include behavioral health, digital wellness therapies, dentistry, nutrition, and prescription management. Historically, a majority of medical innovation pipeline has flowed from West to East. Now with emerging markets contributing 20-30% of the pharmaceutical industry’s value with a double-digit growth (10-15%), a string of global drug and device OEMs are attempting to upend that trend with new products tailored to Asian bodies, lifestyles, and purchasing parity (affordability). Entailing this we anticipate, by 2019, up to 10% of healthcare R&D will be invested to localize innovation for emerging markets in Asia. For instance, Asia-pacific is the strongest market in terms of growth, with more than 30% of the global late-stage trials for cell therapy alone. Moreover, we believe Asia-Pacific will witness the genomics revolution in the next few years and particularly, China will take a leading role in Asia’s genomics space. Entailing this changing paradigm of product development and geographic rollouts – we believe there will be a rise in “unicorn start-ups” (valued over $1 billion) and foreign direct investment riding on increasing demand for healthcare services, an aging population, and rising income levels. As the healthcare industry gets comfortable with data management workflows, we foresee a high number of specialty-specific analytics solutions will gain prominence among providers striving to investigate drug utilization, treatment variability, clinical trial eligibility, billing discrepancy, and self-care program attribution specific to major chronic conditions. We predict that by end of 2019, 50% of all healthcare companies will have resources dedicated to accessing, sharing, and analyzing real-world evidence for use across their organizations. Moving forward, the primary goals for healthcare payers and providers leveraging analytics capabilities will include; population health management (Identify at-risk individuals), identify and coerce to best treatment pathways (lowest cost, best outcomes), and operational automation by patients, payers, physicians, and procedures. Additionally, the convergence of AI and analytics capabilities will continue to advance augmented analytics capabilities to mainstream adoption in the next 2-3 years’ timeframe. Healthcare is at a tipping point with voice - specialized players such as Nuance, Orbita and leading tech companies (Amazon, Apple, Google, and Microsoft) are catching on with targeted voice technologies suited for healthcare industry use cases. We anticipate, though out 2019, HIPAA-compliant voice and chatbot applications for healthcare will gain prominence as these tech titans aggressively compete on voice solutions. However, the current maturity of voice technologies makes it suitable for limited voice-enabled applications such as quick medical scribes and transcription speech-based guided interactions, but not well-suited to conveying lengthy pieces of information. Moving forward, bringing voice technology to vetted clinical use cases such as elderly care, chronic condition management, physician’s assistant will provide growth opportunities. During 2019 blockchain will move from perceived hype to early commercial deployment especially demonstrating initial ROIs across enterprise B2B focused initiatives. We anticipate, by end of 2019, 5%-10% of healthcare-focused enterprise blockchain applications will move from pilot stage to partial/limited commercial availability. Companies such as Change Healthcare, Hashed Health, and Guardtime among others will continue to expand their already commercial use cases. Further, a selective churn of healthcare ICOs and startups’ proof-of–concepts will finally yield few promising use cases going commercial by end of 2019. This will lure early adopters who have waited to finally jump on board creating the much-needed network effect in healthcare space. The debate will now move onto the topic of adoption exploring HOW and WHERE can blockchain technology be used in the healthcare space. There is no denial that health insurance policies available today are aged and often fail to meet the personalized needs of individuals. As a result, the health insurance industry is expected to see less than 1.5% growth during 2018. To ensure future growth globally a number of insurance companies are already providing data and digital-driven healthcare services to their policyholders to personalize the experience and reduce the cost from potential claims. Entailing this we believe, 5-10% of health insurance plans will be linked to lifestyle and health data-driven interactive policies in some form by end of 2019. Frost & Sullivan research suggests that interactive policy will continue to gain popularity globally as it enables insurance companies to leverage individual data and then uses it to personalize premiums and discounts/rewards. 2019 will definitely be an exciting year for healthcare; be prepared for some major transformations and new entrants in the market! Watch our webinar on-demand 2019 Healthcare Predictions – Growth Opportunities, Technology, and Trends. 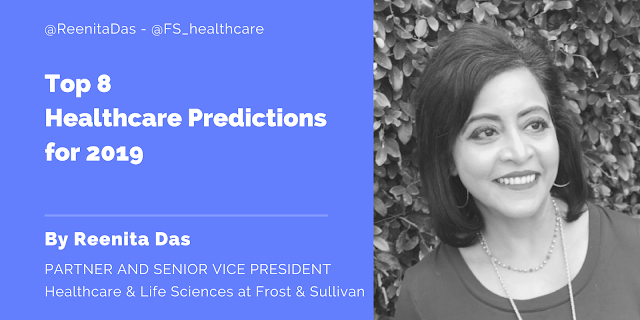 If you would like to receive further insights on Frost & Sullivan research “Global Healthcare Industry Outlook, 2019”, connect with us at [email protected] . I am a partner and Senior Vice President of Healthcare and Life Sciences at Frost & Sullivan, a global growth consulting and research firm. With over 25 years of healthcare consulting experience spanning numerous countries in Asia Pacific, Latin America and Eastern Europe, I have developed a passion for bringing best practices and shared learnings to other parts of the world. I also focus on looking at reverse innovation, issues of convergence and new business models. Today, much of my work is identifying the disruptions, transformation and collapses in the healthcare ecosystem in wide ranging countries and the implications of this for stakeholders. I spend my free time practicing yoga, travelling and learning from other cultures. A passion of mine includes mentoring and inspiring young women to take on leadership roles and focus of STEM based careers.